Ben Franklin once famously said, “An investment in knowledge pays the best interest.” And if you’ve ever grappled with student debt, you know that the quote is true both literally and figuratively. Of course, Franklin was talking about the life-changing potential of education, and we don’t mean to discount that. But Franklin may have been more cynical about “investments in knowledge” if he was around to see the rise of student loan asset-backed securities (SLABS). Student debt has been on the rise for decades now. Total debt and debt-per-borrower are both climbing at accelerating rates. That’s really bad news for students, but pretty great news for lenders and investors. “The best interest” indeed. The total student debt balance in the U.S. currently stands at $1.26 trillion. It’s given rise to a $200 billion asset-backed securities market. SLABS are generally regarded as very safe investments with decent interest rates. But some economists see unnerving similarities to the securitization of subprime housing debt in the 2000s. 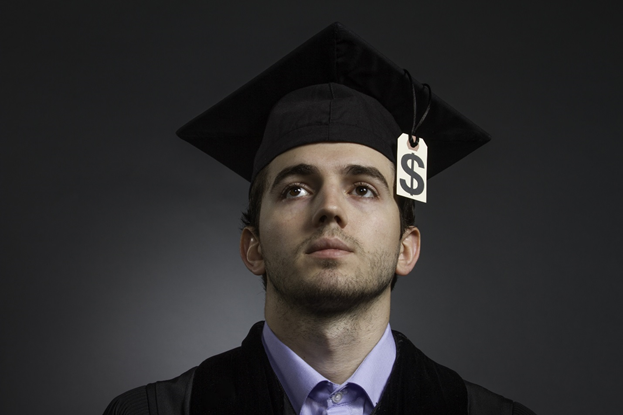 Let’s dive into the strange world of student debt securitization. There are two forms of student debt: public and private. More than 90% of student loans are public, meaning that the government either directly loans the money or guarantees the loan. Public student debt has more favorable conditions for the borrower, but less favorable conditions for the lender. But since the lender here is the U.S. government, it’s not a big issue. The government can borrow money very cheaply, so it charges lower interest rates on its student loans. However, it also does not check borrowers’ credit before lending. As a result, there’s a slightly higher default risk for public loans. But the government still has never lost money on the program. The sheer number of outstanding loans virtually guarantees that the government collects more in interest payments than it loses from defaults. The real action happens in the smaller private student debt market. Here, private lenders like Sallie Mae (Nasdaq: SLM) and Nelnet (NYSE: NNI) package private student debt into SLABS. They charge variable interest rates based on the student’s credit eligibility. This makes private loans more expensive for borrowers, and it’s part of the reason why the market is smaller. Students don’t borrow privately unless they still need money after exhausting their available supply of public loans. In both cases, student debt is refinanced by lending institutions and packaged into asset-backed securities. Then the SLABS are cut into segments called tranches. Finally, the tranches are rated by credit agencies and sold to investors. It’s a very similar process to mortgage debt securitization—with some similar risks. But more on that in a moment. SLABS pay respectable interest rates. They generally range between 1% and 7% per year. However, they’re tranched out in very high denominations meant for purchase by pension plans and institutions. It’s tough to buy SLABS as an individual investor. However, the next best thing is to buy stock in the companies that service SLABS. Sallie Mae and Nelnet are the biggest private student debt lenders. 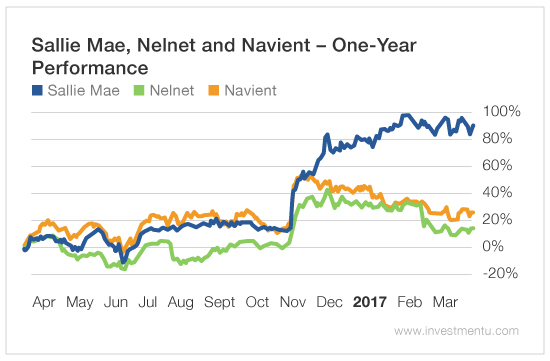 And a Sallie Mae spinoff called Navient (Nasdaq: NAVI) is the largest servicer of public debt. All three stocks have had a great year. They’ve shot up since the election. Trump’s victory has sent interest rates of all kinds skyward. Do the words “asset-backed security” and “tranche” make you uncomfortable? If you were investing back in the 2000s, there’s good reason for that. Student debt securitization is a very similar process to the mortgage debt packaging which caused the 2007-2008 housing bubble. Just like the boisterous lenders profiled in The Big Short, many student debt servicers deal in “subprime” loans. Only a tiny fraction of borrowers ever go through a credit verification process. And the market for these un-vetted SLABS is much larger than the market for subprime MBS’s back in the 2000s. However, there’s one key difference between student debt and mortgage debt. 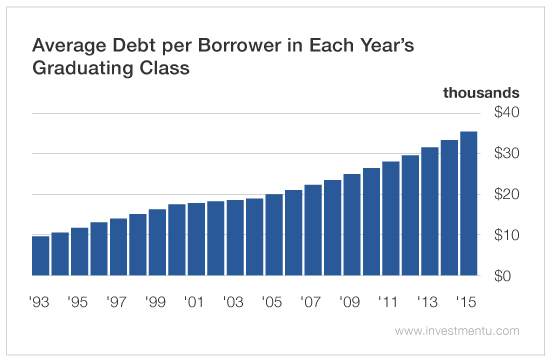 It’s terrible news for indebted students, but great news for investors. Student debt isn’t collateralized, because it’s almost never forgiven. Non-payment, bankruptcy, and in some cases even death cannot cancel a student loan. As a result, defaults have less of a potential to ripple through the financial system than they did in 2008. Unlike subprime mortgage borrowers, student debtors can’t just give up on the loan. Even if they’re in default, they must pay their way out. Otherwise, interest will continue to accumulate. As you can see, SLABS reside in a strange and somewhat depressing corner of the debt market. They’re a booming and profitable asset-backed security. But one could argue that student debt lenders prey on borrowers. And they operate much like subprime mortgage lenders did a decade ago. If you have student debt yourself, the best investment you can make is to pay it off as fast as possible. Reducing your liabilities is an essential step towards building wealth.